I loved being able to vote on the outcomes and the actors’ amazing ability to make things up on the spot. Also I’ve never laughed so much for so long… (the show) really brought an audience of strangers together in a way that I didn’t think was possible! 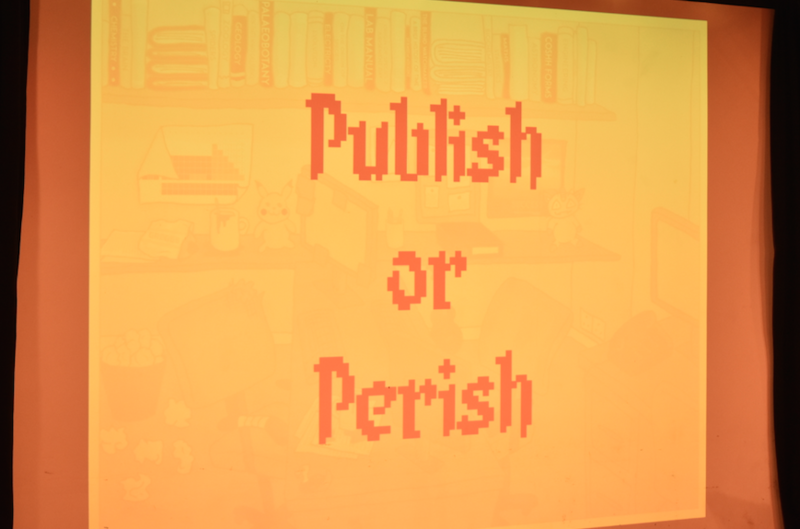 Publish or Perish is a ‘choose-your-own-adventure’ show for the whole audience to play together, where surviving its sci-fantasy world depends on your votes. It’s been performed at Green Man Festival and the Bristol Improv Theatre, and aims to give players a surreal and satirical insight into the life of an academic researcher. Now, we’ve never been shy of a laugh. But from the start of this project we knew we wanted to stretch ourselves and create an outright comedy for the first time. The challenge was to give the audience an truly funny experience while at the same time also putting them in meaningful control of the action. Our starting point was online interactive, nonlinear stories, such as those created with the Twine tool. We added in the group voting mechanic of ‘The Audience’ and, to maximise the chances for audience involvement and for action unique to each performance, built in classic improvisation techniques such as audience suggestions and quick spontaneous games (think Who’s Line Is It Anyway?). The final product mashes up daft songs, live action role play, deadly punning photocopiers, a lab full of improvisers and an unbelievably unhealthy dose of audience suggestions to fantastic effect. Read More Get ready to Level Up with Rising Ape at Green Man 2019!